Activity of the users on social network sites provides an important source of knowledge for business intelligence and individual behavior from their social relationships. Conformity behavior explains the changes that appear in one’s behavior under the influence of other people, is considered a particularly important facet of human existence in social environment. Social network sites, like Facebook provide a great platform to study conformity elements such as subordination to particular patterns of values, opinions, rules, and standards of conduct that exist in a particular social group and its’ influence on market behaviors. This paper analyzed the conformity behavior of 175 Facebook users, mostly college students, through an experimental study using Facebook Graph API protocol and a follow-up user survey. An exploratory analysis on the data show positive correlations between conformity behavior and the posting activity of our study group. 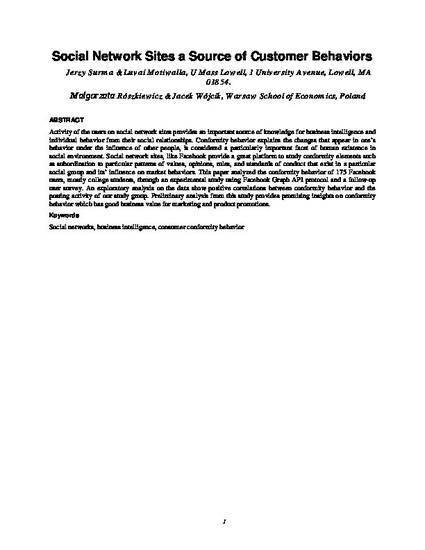 Preliminary analysis from this study provides promising insights on conformity behavior which has good business value for marketing and product promotions.